If you’re fortunate enough to still have money after 2008, you’re doing well as cash is king in a deflationary environment. This is exactly what I’ve been advising my clients, business associates, friends, family, and anyone who would listen over the past two years. When asked where to place their money for safety my response has been U.S. Treasuries. To those who have been mostly in Treasuries and Bonds – congratulations, you have done well. You were in front of the heard of people seeking safety with their money, and your returns were driven skywards by speculators who followed. That said, however, if you just joined the bond party, you’re late. Money, you see, has been playing a game of hide & seek. When fear sets in money HIDEs and the bond market is the place. Eventually rates get driven so low that they can’t go much lower and that’s when money begins to sneak out the door SEEKing returns. For those unfamiliar with bonds, let’s begin with a little review. First of all, the total bond market is considerably larger than the equity market (stocks). There are all types of bonds, but in general they are simply debt instruments that are used to finance businesses, infrastructure, all levels of government, as well as our money through the U.S. Treasury. Treasury notes (or T-Notes) mature in two to ten years. They have a coupon payment every six months, and are commonly issued with maturities dates of 2, 3, 5 or 10 years, for denominations from $100 to $1,000,000. Treasury bonds (T-Bonds, or the long bond) have the longest maturity, from ten years to thirty years. They have a coupon payment every six months like T-Notes, and are commonly issued with maturity of thirty years. The secondary market is highly liquid, so the yield on the most recent T-Bond offering was commonly used as a proxy for long-term interest rates in general. Treasury Inflation-Protected Securities (or TIPS) are the inflation-indexed bonds issued by the U.S. Treasury. These securities were first issued in 1997. The principal is adjusted to the Consumer Price Index, the commonly used measure of inflation. The coupon rate is constant, but generates a different amount of interest when multiplied by the inflation-adjusted principal, thus protecting the holder against inflation. TIPS are currently offered in 5-year, 10-year, 20-year, and 30-year maturities. The price and interest rate of bonds work in an inverse manner. 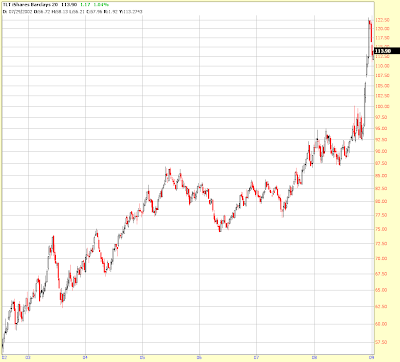 As interest rates move lower, the PRICE of bonds go up, and as interest rates move up, the PRICE of bonds goes down. Thus, it is best to buy bonds when rates are moving lower (like they have been) and to not own them when rates are moving higher. Yes, you would still collect interest by owning them, but that is only one part of owning most bonds. If you hold bonds all the way to maturity then you really don’t care about price movement, you simply collect interest, but most people do not hold long bonds all the way to maturity. 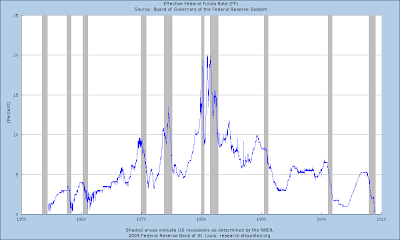 Below is a chart showing the Effective Federal Funds Rate since 1954. This rate has never been lower and cannot go lower, although it can effectively go negative as they already have and did this year and during the Great Depression as well. Note that the high point was in 1980 when then Chairman Volcker raised rates to near 20% to hold off inflation. Think about those extremes… from 20% to zero – we are at the end of the cycle, or the end of something, that’s for sure. Remember that President Nixon entirely removed our currency from the gold standard in 1971, and by 1980 inflation was so high that Volcker had to take extraordinary measures to tamp it down. Home prices in King County, Washington, for example, rose the most in history in 1978, more than 33%! Will we encounter another period of rates that high in the future? Hard to say, but I wouldn’t rule it out, and I wouldn’t rule out some form of monetary “reset” interrupting the entire process at some point relatively soon. By reset, I mean a change in the basic structure of our money system, like what happened with the signing of the Bretton Woods Accord in 1944, or what President Nixon did in 1971, or several other times in the earlier history of the United States. The obvious question then, is how much lower can rates go? And the answer, of course is that the Fed has expended their last interest rate bullet, they are now out of ammo in that regard. All that’s left is “quantitative easing” or the buying up of their own and other entities debt – printing. This is so ridiculous that even a 4th grader would laugh at the notion of someone issuing their own debt and buying it themselves! Bernanke’s theory is that this will hold interest rates down. Great theory, but we’re now going to put that theory to the real world fiat test. Guess what? No fiat currency has ever passed that test in the history of mankind. No nation has ever printed itself into prosperity. I wish it were that easy, its not. Why? Well, the “bond vigilantes” will have something to say about that eventually, and that time may be now. The math of debt is parabolic and bond investors may not be willing to stick around and finance more debt while the Fed attempts to debase the purchasing power of their money. Stage Five is where the real estate industry is today [2005/2006]. This stage can be cruel, as the very people who shouldn’t be buying are. They are the ones who will be hurt the most. The true professionals have found their ‘greater fool’ and are well on their way to the next ‘hot’ sector, like the transition from real estate to commodities now. Those who did not enter the market are caught in a dilemma. They are bombarded daily with stories of easy riches and friends who are amassing great wealth. The strong will not enter at stage five and reconcile themselves to the missed opportunity. The ‘fool’ may even realize that prices can’t keep rising forever… however, they just can’t act on their knowledge. Everything appears safe as long as they quit at least one day before the bubble bursts. The weak provide the final fuel for the fire and eventually get burned late in stage six or seven. “In a deleveraging process, investors are forced to sell almost everything. The asset of ultimate quality and liquidity -- Treasury bills -- becomes the recipient of demand. On the way down, the most risky and illiquid assets fall most. He recognizes, as Hyman Minsky did, who the buyer of last resort is. I view his lobbying efforts as immoral as they push his debts off on the taxpayer which will ultimately prove to be a disaster for our economy and nation… and he knows this! Now that rates have been pushed to nothing and billions have been spent moving bad debt into the public coffers, he’s beginning to sell. He’s an insider in the bond world and his actions should be paid close attention to. And if that isn’t clear enough for you, one of Bill Gross’s associates, Mohamed El-Erian, the investment chief at Pimco, the world's top bond fund, said flatly, "Get out of Treasuries. They are very, very expensive." Someone else who is being very vocal about bonds lately is Peter Schiff, of Euro Pacific Capital, Inc. Peter has been right about a lot of things in the economy, but he was early in thinking that the bond market would unwind. He just wrote a good article called The Fed’s Bubble Trouble. Please click on that link and give it a full read it’s good stuff, but with an inflationary future tilt. The only problem I have with this theory is that I don’t see inflation anytime soon due to the continued unwinding of the shadow banking system. That unwinding is overwhelming, and will continue to overwhelm, the Fed’s actions for some time to come. That doesn’t mean that his spiral theory couldn’t get legs, regardless, as the perceived risk from reckless spending of trillions can be another driver of bond revulsion. So, is the bond market in a bubble? 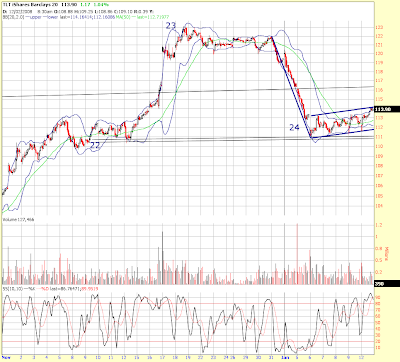 Sure seems that way to me and the chart patterns would seem to confirm that notion. Short term rates are already zero and can’t go any lower. That doesn’t mean that still more speculative and government money can’t go into bonds and drive their price even higher still. Parabolic moves, such as what’s happened with bonds, can go much longer than you think, but they can also reverse and collapse quickly. The most recent examples of parabolic collapses are oil, the shipping and trucking indexes, and many equity markets around the globe such as China, Russia, Iceland, India – heck, half the globe including the United States. You can see that the rise going into the peak was extremely sharp and that the fall so far on the backside is equally sloped. It is possible that the upper points are mislabeled and that points 21 and 22 will wind up going where 23 and 24 currently reside IF bonds break higher immediately and create an even higher parabolic peak. I don’t think that’s going to happen as the big players would be selling into future rallies, even if the Fed is using YOUR money to buy them up, they will be overwhelmed with volume. Intervention of that kind NEVER works for long, the FED cannot possibly buy the entire supply without destroying the value of our currency. And as Peter Schiff pointed out, that creates a spiral, because the more they destroy the currency, the more bond holders want to sell and thus it could spiral out of control. It’s a game that the Fed would be much smarter to NOT PLAY. Unfortunately, they have now repeatedly stated that they intend to play that game – not good as the bond market going down at the same time as equities was pretty much the nail in the coffin that started the Great Depression. You see, having the stock market go down is bad, investors get ruined. But when the bond market goes down, interest rates go up and businesses and governments can’t get funding for projects that create real employment – that’s a more serious problem. Again, Bernanke may have studied the Great Depression, but he didn’t learn much! He would have been much better served to study further back in history about currencies and about the rise and fall of empires. 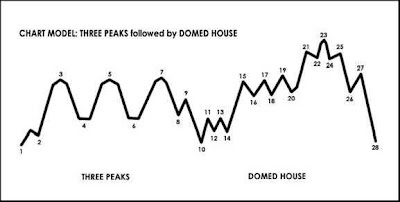 At any rate, that 3 Peaks and a Domed House chart pattern are talking to me loud and clear. If we haven’t witnessed THE peak, then it will be coming very soon. Also note that I drew in some Fibonacci retracement levels… it’s classic that the “shoulders” of the H&S pattern are right on the 38.2% level of the parabolic phase of the move. Note that the H&S target is just above the 78.2% area of the chart, the same height as the little peak on the far left of the chart – a support level. 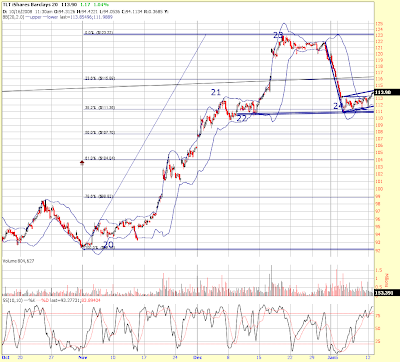 Also, if you look on that chart you will see falling volume as we have been making the right shoulder. That is supportive of the theory that this should break down. So, that’s pretty much the technical picture for TLT as I view it. If this chart pattern is fulfilled, it means dire consequences for America. It means rising interest rates that the Fed has stated they will defend with your future tax dollars. It means that very difficult times lay ahead as we already have known. That said, the Fed may not try to control the entire rate curve, they may just try to defend short term rates as measured by the IRX or the Effective Funds Rate. They cannot defend the entire market or they become the entire market. That’s already happening to a large extent in some other markets, like the mortgage backed securities market. When the government holds or controls every aspect of a market, then we to socialism. 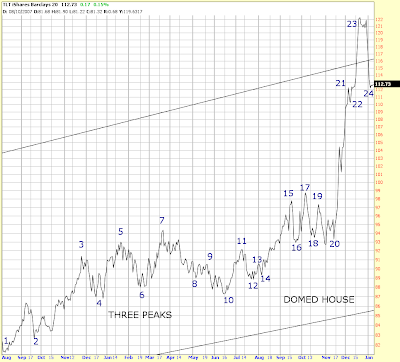 Again, trying to time the end of a parabolic move is NOT for the faint of heart. I have gotten a few of them right, however. I called the beginning of the end of the credit bubble the day New Century Financial filed for bankruptcy in February of 2006 and I believe that to be a watershed event. I called the top of the residential housing market and I spotted the top of the REIT bubble to the exact day and wrote about all of them in my newsletters. 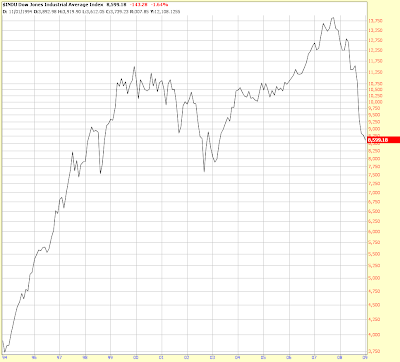 I also called our market decline in October of ’07, and called for a crash/accelerated sell off in October of ’08. I watched China closely and called their parabolic move a bubble that would collapse shortly in a newsletter just a month before it happened. All parabolic moves collapse, the bond market is one. Now, although I am saying the bond market is going to go down, I cannot say how far down it will go. Much depends on our government actions or inactions. Parabolic moves typically correct back to at least the point at which they began their parabolic phase. In this case I wouldn’t be surprised to see TLT trading in the low 80’s in the next few months, although I do leave open the possibility that this is not THE top and that it could zoom higher to create a higher top, but I sincerely doubt it. It’s also possible that the 3 peaks pattern we’re looking at is a smaller pattern within a giant pattern, but since rates are already at zero, I also severely doubt that as well. Tonight I look at the U.S. long bond index, USB and see that it’s sitting right at $135, the same place as the long bond futures (/ZB) at just under $135, and will use a break above that point to admit that I’m wrong for now and will exit that trade. If I am wrong on the timing, I don’t believe it will be much longer now that a clear parabolic blow off top is being formed. The sign to know that the bond market bubble is, in fact, collapsing is when you observe BOTH the stock market and bond market going down in concert or you may find that bonds go down when the market goes up, but fail to move up when the market goes down, and I’m seeing a little of that already. My advice to those who invest in any market is to be aware of what the insiders are doing and saying. As I demonstrated, the heads of the largest bond house in America, Pimco, are recommending that people now stay away from bonds. What to do with your money? That’s the $64,000 question. Cash will remain king, and the government has upped their backing of FDIC accounts to $250,000 for at least a year. If the bond market does descend, that will further pressure the economy and deflation will take deeper hold, thus it may be too soon to jump onto the commodity bandwagon. Times like these are difficult, to say the least. 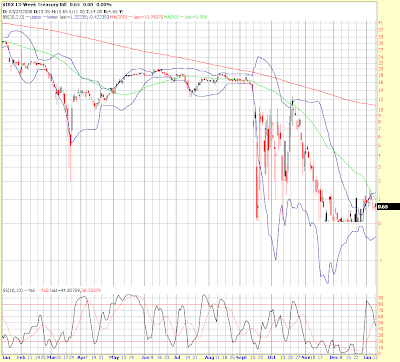 The Fundamental and Technical picture I described lead me to believe that a bond market decline is imminent. I’ve been saying all along that the math underlying our economy does not work. People do not want to admit that, but math is just math. You cannot wish it away and all the Hope in the world won’t make it go away either. The charts and math are talking… my TLT prediction is more than a feeling.